A large section of Pluto’s icy surface is continually renewed by a process called convection that replace older ices with fresher material. Combining computer models with topographic and compositional data gathered by NASA’s New Horizons spacecraft last summer, New Horizons team members have been able to determine the depth of this layer of solid nitrogen ice within Pluto’s distinctive “heart” feature — a large plain informally known as Sputnik Planum — and how fast that ice is flowing. 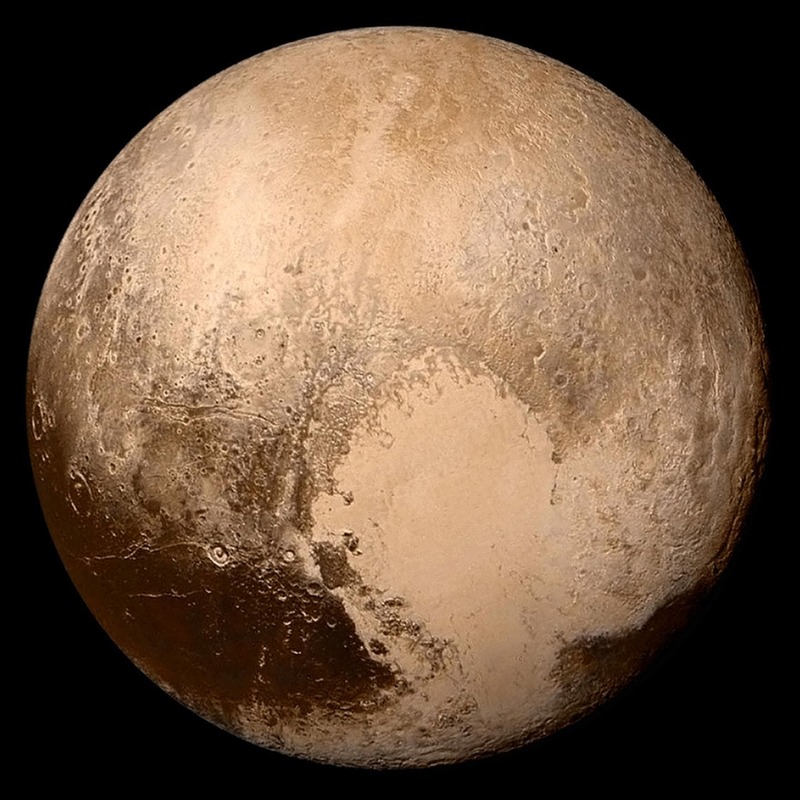 The global view of Pluto shown above is reconstructed from images made during the July 14, 2015 flyby of the dwarf planet. The pristine “heart,” to the lower right, so unlike the features of other icy planets, begs for explanation. 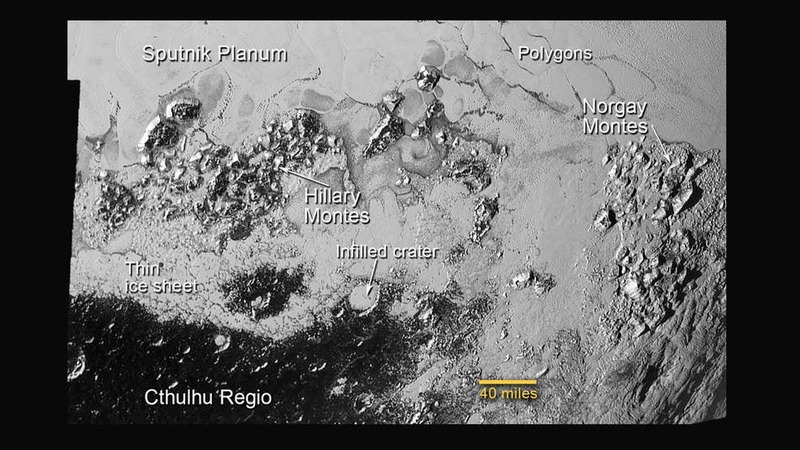 “For the first time, we can really determine what these strange welts of the icy surface of Pluto really are,” said William B. McKinnon, professor of earth an planetary sciences in Arts & Sciences at Washington University in St. Louis, who led the study. “We found evidence that even on a distant cold planet billions of miles from Earth, there is sufficient energy for vigorous geological activity, as long as you have something as soft and pliable as nitrogen ice.” McKinnon is also deputy lead for geology, geophysics and imaging for New Horizons. McKinnon and colleagues believe the pattern of these cells stems from the slow thermal convection of the nitrogen-dominated ices that fill Sputnik Planum. A reservoir that’s likely several miles deep in some places, the solid nitrogen is warmed by Pluto’s modest internal heat, becomes buoyant and rises up in great blobs — think of a lava lamp — before cooling off and sinking again to renew the cycle. “I was extremely happy to use the convection modeling techniques I developed during my recent PhD work at Washington University, and to apply them to this amazing place on Pluto,” said Teresa Wong, a postdoctoral research associate at Washington University and a co-author on the study. These convective surface motions average only a few centimeters a year — about as fast as your fingernails grow — which means cells recycle their surfaces every 500,000 years or so. Slow on human clocks, but a rapid clip on geological timescales. New Horizons also could potentially take a close-up look at a smaller, more ancient object much farther out in the Kuiper Belt: the disk-shaped region beyond the orbit of Neptune believed to contain comets, asteroids and other small, icy bodies. New Horizons flew through the Pluto system on July 14, 2015, making the first close observations of Pluto and its family of five moons. This study was published in the June 2, 2016 issue of the journal Nature.